Our background is in the sign making industry, and long before digital print came along this is what we were doing, going back some 70 years in fact. On this page you will find some of the popular examples of signs for events and permanent use in commercial premises of all kinds. 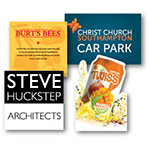 But the range of sign printing and sign making that we can offer is really limitless, and much of sign making is tailor made by working with our customers to display their brand in a unique way in harmony with their company image and ethos. So if you have a branding project, an event, or need signage for a building or estate, the best thing to do is call our helpful friendly team for some straight forward advice in everyday english. This classic go-anywhere sign board combines strength with good looks to match! 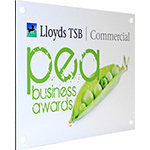 Well priced and immaculately turned out, it's our super seller among sign boards! Suitable for almost any commercial sign: Office, industrial, warehouse, where there is a wall to fix to. 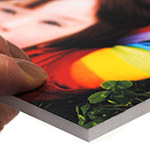 highly durable aluminium dibond sheet printed with inks with a very good outdoor lifespan. Supplied with screws, plugs and Screw cover caps in various colour options (please choose). Sticks on the inside of the glass and is viewed from the outside (white on the back). 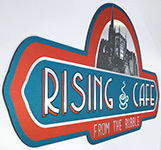 A permanent grade window sticker sign made from two layers of durable vinyl film protecting the printed image or lettering. 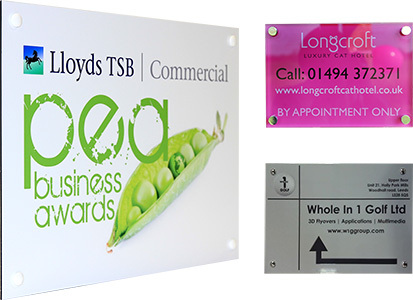 The contemporary look for your premises signs. Highly durable brushed steel effect aluminium (dibond) sheet printed with inks with a very good outdoor lifespan. 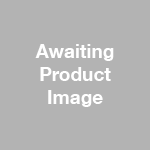 Supplied with screws, plugs and Screw cover caps in various colour options (please choose below). A very lightweight rigid board, looks great with white smooth matt card based surfaces both sides and white foam in the centre. Attractively priced but can warp especially if printed or laminated one side only, and very delicate to handle, so not suitable for frequent handling or being in regular contact with the public. For cut-out to shape prints contour cutting has a minimum radius of 3cm. 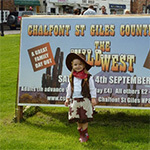 Make an impact at your outdoor event this year with our low cost yet very durable Outdoor Event Signs. This go-anywhere sign board can be easily mounted to posts & fences and we can optionally supply it with drill holes and cable ties or plastic bolts for post mounting.